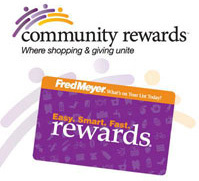 Link your Fred Meyer Community Rewards card to the CCC Foundation. You will still receive your own rewards and help provide Emergency, Textbook & Childcare Grants! When you shop at AmazonSmile, you'll find the exact same low prices, vast selection and convenient shopping experience as Amazon.com, with the added bonus that Amazon will donate a portion of the purchase price to the CCC Foundation.